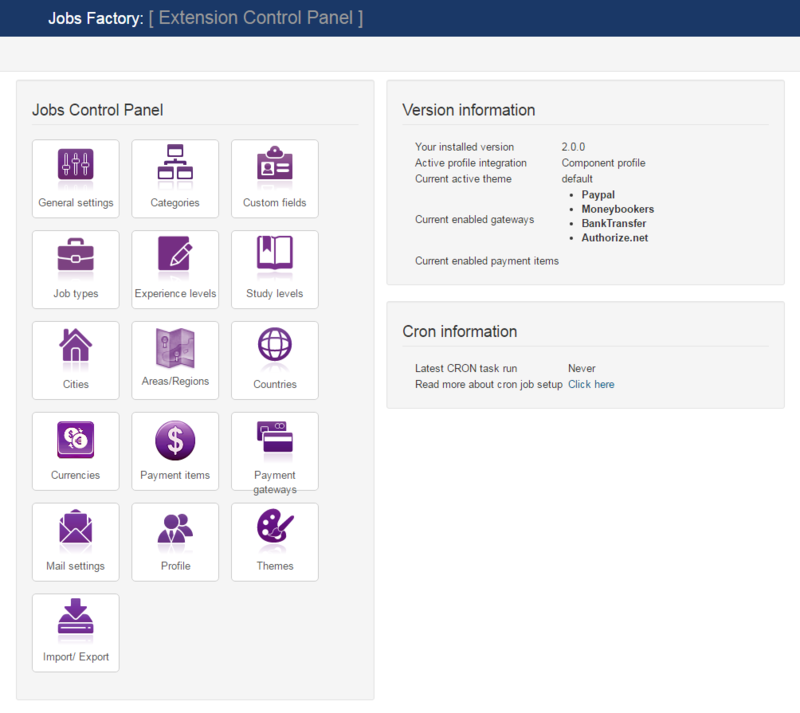 To edit most of the options available for Jobs Factory go to Components/Jobs Factory/Settings in the Joomla backend and click on General Settings. Select the default format for date and time available on the component, “d” stands for Day, “m” for Month and “Y” for year. “H:i” is for a 24 hour representation of time while “h:iA” is for a 12 hour format. Users will be able to select the date and time when they created new job offers which then will be displayed on the job details page. Enable Set Expiration hour to allow users to specify an expiration hour when they create new job offers. If disabled, offers will expire at midnight. As a recruitment component, Jobs Factory offers multiple ways for companies to contact the candidates, such as telephone number, email, skype id, facebook link, etc. All of these will be displayed if users fill them and if Show Contact Information option is enabled. Companies can be rated by candidates in order to differentiate them by their professionalism. Enable Rate companies for this feature to be available on front end. Define how the salaries will be displayed on the component by setting up the Decimals number and the separator symbol for decimals and thousands. Set a CRON Password which will be used to safely call the CRON script. Click HERE for more information on how to set up CRON for Jobs Factory. Enable Send Resumes by Email in order to receive emails when CRON runs with the resumes of candidates which have recently updated their profile. Resume Notification Address refers to the email address on which the resumes will be send. In case you leave this field empty, the resumes will be send at the "From email" address found at System > Global Configuration > Server. For more information regarding this feature please check this link. Items per Page sets the maximum amount of jobs visible on the listing pages, once this amount exceeds the limit, pagination will be created. Filter includes Subcategories will display the jobs from subcategories together in the listing with their respective parent category. Job candidates and companies can upload files using our component for a more in depth look at possible employees or job offers. In order for users to be allowed to upload attachments, you will first need to enable the following two options: Enable Candidate Resume Attachment for candidates, and Enable Job Attachment Files for companies. Furthermore, you can set which extensions are allowed as attachments (pdf,txt,zip, rar, etc.) for both types and to set a maximum size of the files. You can choose between 2 ways of how the companies can post their new job offers, one with a one step posting where all the job information is entered in one page, and another, that will require them to set the category first and then the rest of the information. Besides ACL, listings can also be actively moderated. By enabling Admin Approval, all job offers will need to be manually approved by an administrator from backend before being published on frontend. Set the maximum amount of time(in months) a job can be published as well as the amount of time it will be kept in archive before deleting it. Add 0 for unlimited time. Set Default End Date offset as the number of days to offset the default end date from the current date. Take into account that timezone differences may affect this offset. With Set Job Visibility enabled, public or confidential jobs can be set by the employer. If disabled, you will need to select below a default visibility value. Default Candidate Visibility: set the default visibility value for candidates in candidate list and search results. Default Employer and Job Visibility: set the default visibility value for the jobs and employers value. With Set Job State enabled, the company can publish the job offer right away or keep it unpublished. If disabled, you will need to select the Default Job State. For each job, companyes can add relevant tags to them, set here the maximum number of tags allowed per listing. Use location management will let users select their state and city from a list of predefined locations instead of manually typing them. On the Image Settings page you can enable/disable the images for listings. In case you choose to disable them, there will be no gallery, and no fields to upload images. In case the images are enabled, you can add a Maximum picture size and to choose if a main picture is required for all user profiles. On the right side of this page you can add the thumbnails images resize values in width and height. In order to have functional Google Maps on your website you will need an API key, to get one click on Get API Key and follow the instructions found there. After you entered the API, you can define settings like the default position of the map by latitude and longitude and also the zoom level. Below these you can select the distance unit(kilometers or miles) that will be displayed and the values for it. You can enable Google Maps to be displayed in every job details page. If enabled, you can define the width and height of the map for this section and select which type of map will be used (Roadmap, Hybrid, Satellite, Terrain). To protect your website against spam you can use one of the email protection methods available for our component. This tab allows you to set them up. Once you enabled the Email Spam protection feature, make sure you choose which Email spam plugin you will be using. In case you choose reCaptcha Mailhide, you have to add a public and a private key, clicking on Get it here will take you to the ReCaptcha site to obtain your keys. This tab comes with a simple text editor where you can add Terms and conditions. Users have to read and agree with the Terms & conditions by checking the tickbox every time they post job offers. The System Info tab is implemented to provide basic information about the cache directory, upload directory or configuration file. These are useful for debugging if any issues arise. The component handles the configuration file permissions itself, even if the configuration file might be Unwritable, the component will still be able to save the configuration and restore previous permissions. (!) After working on the smarty .tpl files, it is recommended to purge the cache so the changes can take effect right away. 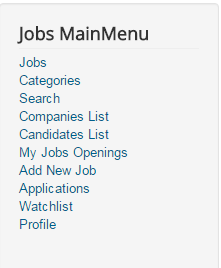 Jobs Factory's menu comes with many menu items that you can enable/disable or edit afterwards. Jobs - displays lists with all the active or archived job offers. Categories - displays lists with the available categories. Search - provides various search forms. Companies List - displays a list with all the companies who updated their profiles. Candidates List - displays a list with all the candidates who applied at least once for a job. My Jobs Openings - contains lists of your published, drafted or archived offers. Add New Job - the new job offer form, accessible only for Companies. Applied List - displays all the jobs where you have applied. Watchlist - displays lists with various items added to the watchlist. Profile - the place where companies and candidates can add specific details and also for companies to add funds used for the payment items. Jobs can be grouped in various categories depending on what you have set on the backend. Categories section of the Control Panel allows you to add new categories or to change their order. The component supports unlimited category levels.